On a PC: Click on the ‘Connect’ button to connect to a BSL interpreter. 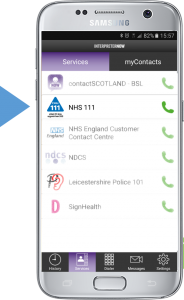 On a phone or tablet: Tap on the NHS 111 logo in the InterpreterNow app. You need a modern computer with a webcam, or the InterpreterNow app on your smartphone or tablet, and a good broadband internet connection. It is best if no one else is using your internet connection while you are on the call, especially not for online games, streaming music or watching films. If your video call fails while you are connected to the interpreter, try again. You may need to restart your computer. Click HERE to register with InterpreterNow and download the app. This is a summary of why NHS 111 collects your personal information, how it may be used and your rights. What type of information will we record about you? To provide you with urgent (non-emergency) medical help and advice through our NHS 111 service, we will collect information about you to help us identify you and provide you with appropriate medical help and advice. We will record information about your condition and the advice we have provided. This information will be recorded on a computer system. What happens to your clinical records? 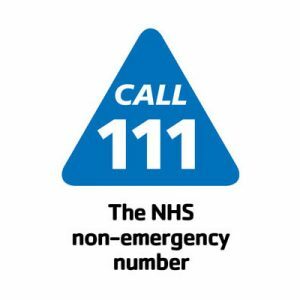 If you ring NHS 111 we may need to share some health information about you with your GP and additionally with other health or social care providers in order to provide you with appropriate care. If you do not wish information about you to be shared we will give you the opportunity to say so, however this may impact on the services and support that can be provided to you. The health and social care professionals involved in your treatment or care may ask us for information about your use of our services or the treatment you received. We will be careful about sharing information in these circumstances and will only do so once we are satisfied that they need this information in order to provide care to you. How else is information about you used? Help staff review the care and advice they provide to ensure it is of the highest standard e.g. call reviews are undertaken by clinicians within ours and our commissioner’s organisations to ensure clinical standards and quality are maintained. We will ask your permission and respect your wishes if you do not agree to your information being used for this purpose. Wherever possible the information will be anonymised. If we have a requirement to use information that does identify you we will explain how and why your information will be used and obtain your permission. Sometimes the law allows the NHS to share your personal health information without your permission, for example, to investigate a serious crime or to protect a child. How do you know your records will be kept confidential? All NHS organisations have a legal duty of confidence to their patients and the Data Protection Act 1998 further defines how we can collect and handle personal information. All NHS organisations are required to appoint a Caldicott Guardian to ensure patient information is handled in accordance with legal and NHS regulations. The Data Protection Act 1998 allows you to find out what information about you is held by NHS 111. This is known as the “right of subject access”. Please note that all calls to the urgent (non-emergency) medical help and advice line (NHS 111) are recorded for the purposes of patient care, staff training, quality and audit purposes and untoward incidents.